Last year saw significant increases in full-year revenues and profits at UK-based Tarsus Group, with the company scoring a 42 percent revenue increase to £61.7 million ($97 million), compared with £43.6 million ($69 million) in 2010, and adjusted profit before tax was up 77 percent to £16.8m ($26 million), compared with £9.5 million ($15 million) the year before. “2011 was a record year, with the Group achieving a strong financial performance, both on a year-on-year and biennial basis, and we have halved our debt level,” said Neville Buch, chairman of Tarsus Group. Net debt was halved ahead of expectations to £13.7 million ($22 million) last year from £28.6 million ($45 million) in 2010. In line with the company’s Project 50/13, whereby 50 percent of Group revenue will be sourced from the emerging markets by 2013, 38 percent of Group revenue in 2011 was derived from those markets. As part of the Project 50/13 strategy, Tarsus acquired a 75-percent stake in Turkey’s International Fairs Organization last year. The Middle East and China also saw good results in 2011, with revenues in the Middle East increasing to £21.2 million ($33 million), compared with £7.5 million ($12 million) in 2010, reflecting the occurrence of the biennial Dubai Airshow, which continued to grow last year. In China, Hope, the company’s Chinese joint venture, delivered a record performance in 2011, with revenues up 25 percent. Labelexpo Asia, which took place in late November in Shanghai, also saw increases in revenues and visitors by 44 percent and 9 percent, respectively. The event saw an increase in customer sales and, as a result, rebookings for the 2013 edition were at record levels. In addition, there were stronger than expected results from the U.S. business, with the medical division scoring 23 percent organic revenue growth in 2011. Some of the growth in the medical division came from the launch of additional educational events and online content in new and fast-developing areas of preventative medicine. 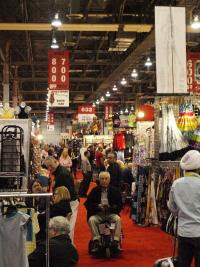 The Offprice show, which runs alongside Las Vegas Fashion Week, also saw strong results for its 2011 February and August shows, with revenues up 10 percent and 6 percent, respectively. Overall revenues in the U.S. were down to £16.2 million ($25 million) last year, compared with £18.7 million ($29 million) in 2010, mainly because the biennial Labelexpo Americas runs in even years. "We are pleased and proud of the financial performance of the Group in 2011, which reflects the successful execution of our 50/13 strategy," said Tarsus Group Managing Director Douglas Emslie. He added, "We are excited about the opportunities to develop the business over the next 24 months and look forward to growing our businesses in our key markets of the US, China, Middle East and Turkey both organically and through acquisition." Tarsus Group’s European division didn’t see the same positive results as the rest of its businesses. Comparable year results, 2011 and 2009, when Labelexpo occurs, were £24.3 million ($38 million) and £26.7 million ($42 million), respectively. However, Labelexpo had its best results in 30 years in 2011, and the company reduced its exposure to more challenging market sectors by selling the France-based show, Modamont. Looking to the future, Tarsus expects 50 percent of its group revenue to be generated from the U.S. in 2012, with strong forward bookings for Offprice, Labelexpo Americas and the Medical Division. The emerging markets portfolio also is seeing strong bookings in Turkey, China and Dubai. Tarsus remains confident about the outlook for 2012 and the continued implementation of its strategy through a combination of organic growth and carefully targeted acquisitions, according to company officials.